Helveticahaus, the online retailer of Helvetica-themed and -inspired products founded by CK and Linda Anderson in 2015, recently announced a new addition to its popular line of guest artist-designed T-shirts. Artist Series no. 5, which landed in the Hh store last month, was created by the Andersons’ daughter Haley, a graphic designer at Seattle’s Studio SC who’s also been featured in the prestigious visual communications journal Communication Arts. Her design pays homage to the late Harold Balazs – one of the Inland Northwest’s most renowned artists and a family friend – through a playfully abstract pattern peppered with fragments of Helvetica Bold. 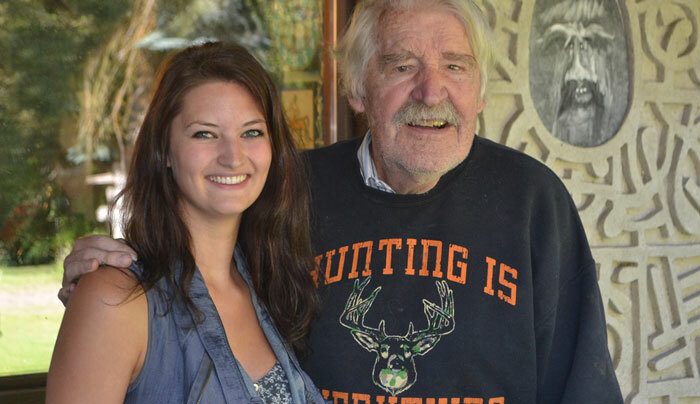 Haley Anderson, left, with Harold Balazs at the artist's home in 2011. “Harold’s spunky, funky works always left a smile on my face,” she says. “I wanted to make something playful that would capture the energetic side of the font – so why not make some alphabet soup?” All proceeds from Helveticahaus sales go toward providing financial support for graphic design students at Spokane Falls Community College – the founders’ alma mater. Criteria for the scholarship include need, work ethic, and design excellence.